CPI makes its mark at an industry trade show with this beautiful product video featuring rich 3D animation of its new SCR cash note-processing machine by DDA. Crane Payment Innovations (CPI) is a company that specializing in the design and production of a wide variety of machines to facilitate automated monetary transactions. Used in numerous markets, from transportation and vending to gaming, retail, and financial services, CPI boasts a consistent history of steady innovation. They had seen DDA's past 3D animation work for C8 MediSensors and were so inspired by the exceptional quality exhibited in the video that they reached out to DDA to develop their own product video for an upcoming trade show. However, CPI was on a tight timeline, needing to have the finished video ready for the trade show in a mere 4 weeks. DDA was happy to oblige. Due to the precise nature of the engineering of its distinguishing features, the product video would need to present the SCR in crystal clear detail. 3D animation allowed for the presentation of the product through transparencies so that key features could be highlighted, with functions demonstrated in motion to concretely demonstrate the SCR's unique value propositions. Entry and exit sensors ensure accurate accounting of notes, with the device able to detect when the unit is opened during a powered-down state. Note recyclers help to save on service maintenance costs and exposure to fraud by using received notes for change, and an anti-stringing module protects against fishing, a common source of fraud in the gaming industry. The combination of industry-leading security and efficiency would come through easily in the richly detailed 3D animations of the SCR machine. DDA worked with the client's drafted script to arrive at a final finished version for the video. 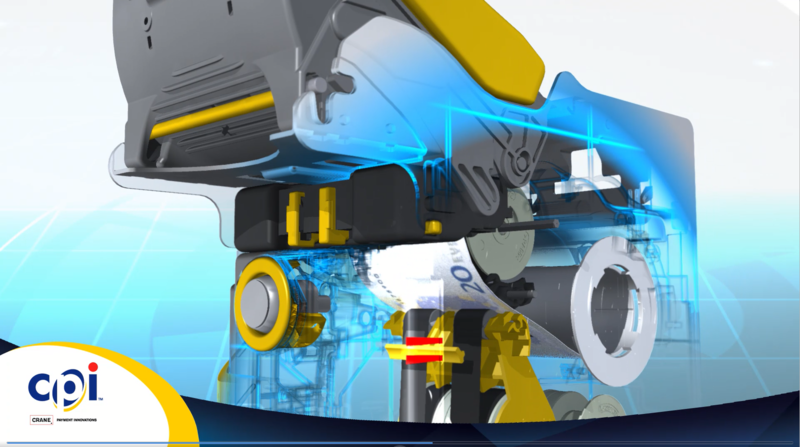 The 3D model of the product provided was not entirely accurate, so DDA put considerable work in refining it into a realistic 3D model of the SCR machine for use in the video. DDA then commenced with developing renders of the 3D model for scene-to-scene transitions, and added transparency to the surface of the machine so that its inner workings could be displayed to the viewer clearly, thus demonstrating the functionality and value of the security features and unique note recycling with vivid detail that strongly reinforces the strength of the inherent SCR design. The video starts with an introduction to the CPI story: a history of steady innovation that demonstrates both the unique value and originality of the brand, while also ensuring a considered approach to new technologies that helps reassure the viewer of the reliability of their unique designs. This story is told through the identification of the many products developed prior to the SCR upon which its legacy is built. Richly detailed 3D animations of the SCR itself then demonstrate the security and efficiency advantages inherent in the product's unique design, with transparencies used to highlight key components and their function to demonstrate these features in colorful motion. Next, the video shows the SCR in action within the context of casino gaming, with the winnings disbursed using the SCR's note recyclers, moving from a 3D animation of the SCR model itself and out to b-roll footage of a transaction with a casino gaming machine. Then, the video presents all of the SCR's predecessors in chronological order, effectively communicating a strong tradition of continuous leadership and growth in the industry, indicating both the quality and reliability of the brand as a whole. The new SCR product video with 3D animation was well received by the client: "Oh my. I love that!" DDA received further accolades upon debuting the video at the February 3 trade show: "I thought it was going to be a tough task to turn around a video in less than a month, let alone a video with this quality. Thank you very much for all your help." DDA would go on to create a shorter version of the video with a different style for the transportation industry, and also assisted CPI in the developing of the design and messaging around a new CPI employee recognition program.